RUN BY THE SAME Family SINCE 1971, freehouse since THE MID 90'S. The Jolly Farmer is one of the few remaining family owned and run independent freehouses in the south east of England. Our aim is to provide our guests with the highest possible standard of food, drink and accommodation in clean, attractive surroundings complimented by a warm welcome and a pleasant atmosphere. A traditional ale house at heart, we have a constantly changing selection of up to 8 real ales, sourced from breweries big and small across Great Britain. Teamed with delicious, home cooked food, made with the freshest, local ingredients, we think you're going to love what we have to offer. Steve, Chris and the team. For almost half a century, we've been well known for our commitment to fantastic beer, we offer up to 8 daily changing real ales, sourced from breweries big and small from across great Britain. A further 10 premium lagers and craft beers from England and Europe can be found on our counter, as well as two draught English ciders. If none of these take your fancy, our beer lineup is completed by a range of bottled beers, with something for every taste. Greene King, Westgate Brewery, Bury St Edmunds, Suffolk. The Crafty Brewing co. Ltd, Thatched House Farm, Dunsfold Rd, Loxhill, Godalming Surrey. Crafty One (4.2%) Fresh lemon aroma with a soft delicate flavor. Wigan Brewhouse, The Old Brewery, Brewery Yard, Off Wallgate, Wigan. Old Boston (4.4%) A dark and rich porter which bursts with roasted malt flavours; handsomely black, with a creamy white head and smoky aromas with an intense blend of bitter roasted malts. It has a creamy texture throughout which the sweet plum taste penetrates and is also on the nose from the natural plum flavouring. Milestone Brewing Co, Great North Road, Cromwell, Newark, Nottinghamshire. St Georges Legend (4.0%) Rich, smooth, deep red ale. Laughing Wolf APA (4.4%) American style craft keg. The Crafty Brewing co. Ltd, Surrey. London Pale Ale 4.5% ~ Craft Keg, Meantime, Greenwich, London. Yardbird (4%) ~ Inspired by American pale ales, Fruity and hoppy. Stowford Press Cider 4.5% ~ Herefordshire. Aspalls Suffolk Cyder 5.5% ~ Suffolk. Our carefully curated wine offering is sourced from the old world and new, providing a great selection for all tastes and budgets. We also offer a selection of rare fine reds, from some of the worlds best producers. Click here to download our wine list. At the Jolly our Chefs cook from fresh. Our menu changes regularly with a strong emphasis on seasonality. Where possible we source our produce locally. Modern British fare, from fresh British produce, prepared with care & passion and served in a relaxed & comfortable setting. We offer dedicated menus for customers who are vegetarian or vegan, or those with a gluten free diet. We are happy to cater for any dietary requirements, please inform a member of staff of your requirements when you arrive. Our famous carvery is available Sunday lunchtime from 12.00 to 3.00 year round. Self service with meat carved to order. Choose from any or all of Scottish top rump beef, leg of English lamb, honey roast ham, loin of pork or turkey breast. Served with roast potatoes, yorkshire puddings, stuffing, cauli cheese and a wide selection of fresh seasonal vegetables. A vegan nut roast is also available served with vegan roasties, veg & gravy. Our finger buffets can be tailored to your individual budgets and requirements, and are hosted in our beautiful 400 year old barn. We can compliment our lovingly crafted, home made buffet with drinks packages. Be it tea and coffee or something stronger, we are happy to meet your needs. At the Jolly Farmer we offer bed and breakfast in three beautiful double rooms, and a full suite. Filled with historic oak beams, wattle and daub walls, and oodles of character, its the perfect place for any stay. We also offer a three bedroom, self contained flat, which sleeps up to five people, with an open plan kitchen, dining and living area. Extra child beds are available in all rooms for £15, cots for babies are available free of charge, please let us know your requirements at the time of booking. We allow dogs in all our rooms with an additional cleaning charge of £12 per dog, per night. We ask that guests bring a suitable bed for their dog, and do not allow them on any furniture. Smoking is not permitted in any of our rooms. 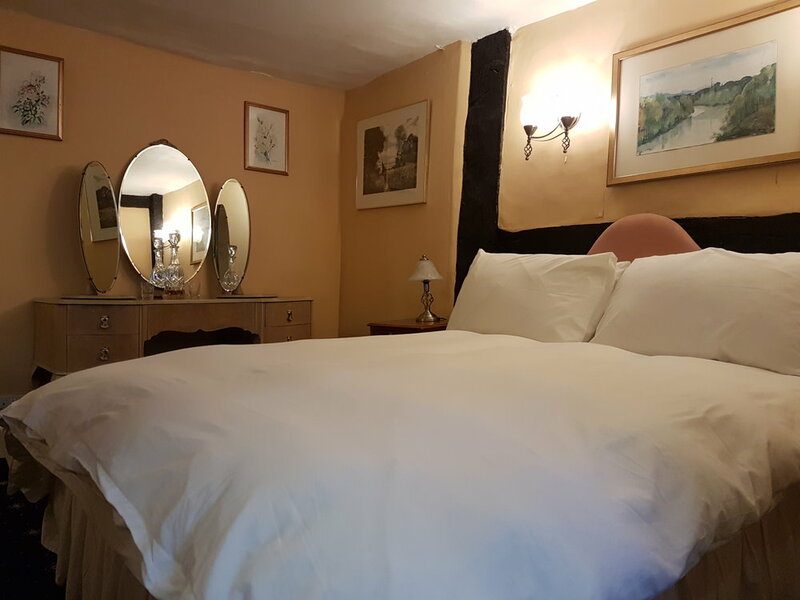 We have three beautiful en suite double rooms, each with their own individual period features, All double rooms feature full en-suite bathrooms, complementary hot drinks, toiletries and sherry. Priced at £75 per night for single occupancy, or £90 per night for double occupancy. Our full suite features a king size bed, a separate living room and en-suite shower room. Exposed wattle and daub walls, and views of Bramley's historic medieval church give our suite a unique character. Hot drinks, toiletries, and sherry included. Priced at £95 per night for single occupancy, or £110 per night for double occupancy. Located opposite the pub in the centre of Bramley is our self contained flat. Our flat sleeps up to five people, in two twin rooms and one single. The flat has two bathrooms, a living room and a fully equipped open plan kitchen and dining area. Hot drinks & toiletries included. Priced from £110 to £200 per night based on occupancy. The Jolly is located in the village of Bramley, just south of Guildford in the surrey hills. Our infamous quiz night is on every other Wednesday! A bucket of beer for the winners and a much sought after wooden spoon for the runners up.